I could really use some help with this. I want to have a nice Vinyl Super Bowl Champions Banner made for my Hawk Cave. 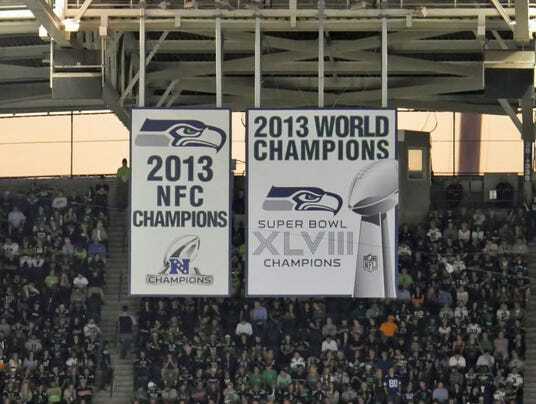 I would like it be an exact replica of the banner hanging up at Century Link. Every place that makes banners wants a high resolution picture of the banner. Does anybody out there have a high resolution picture of the Championship banner or do they know where I could get one? It would be very much appreciated. This is about the best I've been able to find. You will have to cut it etc and it isn't straight on. BullHawk33 wrote: This is about the best I've been able to find. You will have to cut it etc and it isn't straight on. Thanks, sadly that one doesn't work as it is not high resolution. I appreciate the effort though. if i could figure out the fonts they are using, i could probably recreate something fairly close in photoshop at high res. I would gladly compensate someone for their time if they were able to create a high resolution picture of this in Photoshop or any other program. 12thManNate wrote: I would gladly compensate someone for their time if they were able to create a high resolution picture of this in Photoshop or any other program. here's the start I've got, low res version. Just need to get the fonts in and do a couple cleanup things and eyeball some of the tints and tones. the actual working file is 36" tall at 300 DPI so should be plenty of resolution for anything printed poster size. Hawknballs wrote: here's the start I've got, low res version. Cool, let me know when it's done, I have a friend with a print shop that could print that on canvas 48" wide by whatever tall that works out to. An Illustrator file would actually work best. You wouldn't have to worry about DPI or the size of the image, as vector art scales indefinitely without losing detail. I could give it a go, if you'd like, but it's been a while since I've done gradient work with the pen tool. Shouldn't be too difficult though. Then again, Hawknballs' picture is pretty good so far. I would also like to print a vinyl banner for the game room and also give one as gift this Christmas. My banners are shipped and should be here tomorrow, I will post pictures after they arrive. You actually be using three programs to create this if you are re-creating it. Photoshop for the Lombardi trophy, Illustrator to rasterize and make it vectorable, and then InDesign to create the fonts. But if you really wanted to cheat on it, you could just rasterize a low res version in Illustrator and hope it scaled well. It might not. otter wrote: You actually be using three programs to create this if you are re-creating it. Photoshop for the Lombardi trophy, Illustrator to rasterize and make it vectorable, and then InDesign to create the fonts. But if you really wanted to cheat on it, you could just rasterize a low res version in Illustrator and hope it scaled well. It might not. Not entirely sure what you're talking about here. Rasterize to make it vectorable? InDesign to create the fonts? Low res version in Illustrator? Illustrator being vector, has NO resolution. It's just a mathematical representation of what you're seeing on screen. This entire project could be created in Illustrator (a Vector based application) that would scale to be put on the side of a building if you wanted to. If you wanted to make a high resolution raster image that would print plenty well, it could easily be done in Photoshop. If someone wants to send me the raster (Photoshop) recreation, I will make a vector version for anyone to use, to print any size imaginable. Yup, Anguish is spot on. The best way to handle this is designing it as vector in Illustrator and output as an .eps file which can be resized by the printer at any size they want whether it's a flyer or 100 feet tall on the side of Century Link. Thanks for the Fonts Anguish. Appreciate it. I was looking at something like 2'x3' on vinyl. Also, esigns has some pretty decent prices on aluminum as well. Here is the finished banner. This one is 6 feet by 5 feet. 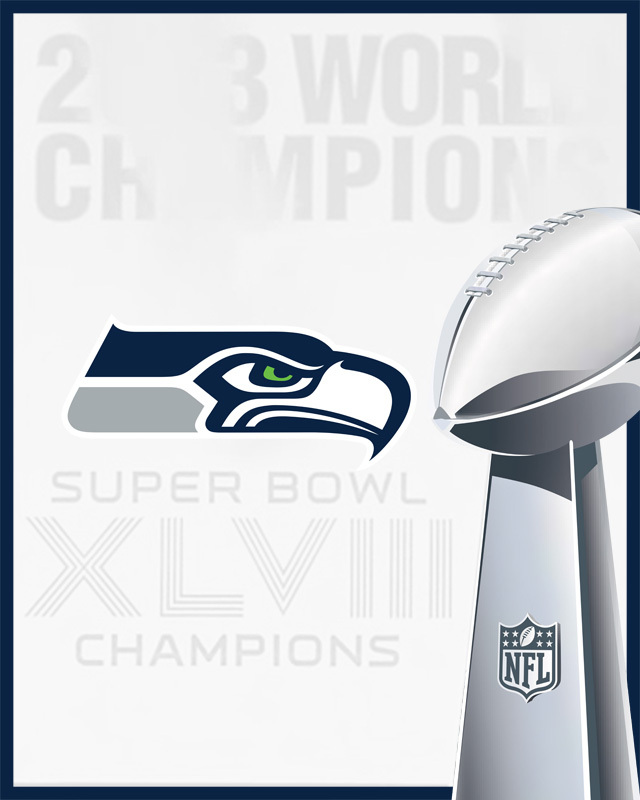 12thManNate wrote: Here is the finished banner. This one is 6 feet by 5 feet. p.s. your next banner should be of Crabtree so your guests can take pictures of "The Tip" followed by a banner of Erin Andrews so you can do the interview too. Wow - you guys are amazing! Anyone want to hook me up with a high-res file I can use for a Christmas present? Nate that is awesome. Any way you could pm or email me the image used to make that? Would be great if we could get hooked up. Looks good, good job HawknBalls on the recreation and the print shop for the outcome of the banner. theincrediblesok wrote: Looks good, good job HawknBalls on the recreation and the print shop for the outcome of the banner. actually that wasn't mine, but it looks awesome! I messaged the OP while I was working on it but he let me know someone beat me to getting it to him. I would love to buy one of those if that's possible. Just out of curiosity what was the font for the text at the top? That was the only part I couldn't figure out. I found a few that were close but it looks like that one is exact. Anguish wrote: This entire project could be created in Illustrator (a Vector based application) that would scale to be put on the side of a building if you wanted to. As someone with an degree in design, this is correct. yeah that looks right. for whatever reason I couldn't find a Helvetica style that matched up just right. Mostly in the W and M. Although I was probably overthinking a detail that didn't really matter. I'm in for a larger sized banner if someone is willing to put together a group buy. daveCFPrez wrote: I'm in for a larger sized banner if someone is willing to put together a group buy. It should be easy enough for anyone to take the file and upload it to one of the many online print shops (e.g. esigns, Vista Print, Staples). You can get a 2' x 3' vinyl banner for $15 from esigns and they're even doing a BOGO saie through Friday. That's the route I'd go. Hey Neil, if you make that final rendering send it my way. I would love a PM from the creator of the file used to make this banner. It would be greatly appreciated. Hawknballs is correct, somebody else did complete the project of a high resolution for me,however I did have to pay for it to be done for me. I ordered 15 of these banners at 4x3 size (the file does not fit into 3x2) as I have some friends that also want one. If anyone is interested in purchasing a 4x3 vinyl banner of this, feel free to pm me. Those that want to wait, I'll make the vector replica this weekend, and post it here for download. Anguish wrote: Those that want to wait, I'll make the vector replica this weekend, and post it here for download. Not trying to be a cheapskate, but if you're willing to do that then I'm certainly willing to wait for the download. Thanks! And thanks to everyone who's been working on this. I'm impressed how quickly replica banners have been produced from a casual online forum thread, and pretty much from scratch even! Thank you to everyone who has contributed to this. A wonderful community indeed! Ahh ok good job to both of ya! Would the designer(s) who made the banner be able to offer it as a vector file for download to the community? Like an .eps or .ai file? I know many would appreciate that. Nice job! Aros wrote: Would the designer(s) who made the banner be able to offer it as a vector file for download to the community? Like an .eps or .ai file? I know many would appreciate that. Nice job! Along those same lines, if anyone could post detailed instructions about replicating that banner pictured above, and any recommendations for places that would do it, it would be GREATLY appreciated. As I mentioned previously, I'll provide the EPS vector file this weekend. It will be linked in this thread for download. Simply take that file to a printer that prints vinyl banners and voila. It could easily be printed on poster paper and framed, or printed on aluminum like a street sign, etc. once you have the EPS, a printer/sign maker could do anything with it. Note, however, that this is for your personal use. I'm sure it violates about a hundred copyright and trademark laws, so don't try and sell it or use it for any other profitable means. I'm only going to provide a file for which you will be responsible for its use. Yeah, as I mentioned earlier, you can simply upload the file to esigns.com, Vista Print, Staples, etc. I was already messing around with esigns so I'll probably just go with them, considering they're currently doing a BOGO sale and the prices are already good. Also, as Anguish mentioned, they do metal signs as well. It's really easy to print a banner from one of the popular online shops. Awesome. Can't wait!! Great work everyone. Man I love his place. The white around the outside is a 'bleed' which most printers will require. BTW, Hawknballs, I had to modify just about every letter when starting with Helvetica Condensed Black. It's close, but not quite right as you stated. So awesome to have this. Thanks Anguish, and thanks to everyone in this thread for all the contributions. Just another example of how awesome this community is. Evil Dead wrote: Completely badass. Great job Anguish! Looks pretty official to me. And I also want to express my gratitude to everyone else working on this project. A wonderful community indeed!